There are stereotypes about engineering students. Those guys and gals are no fun, all they want to do is go over tables of blueprints and listen to lectures on the individual components of a device which itself will be the focus of a later lecture (which they can’t wait to attend). 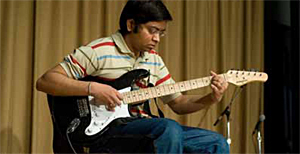 Vaibhav Gupta serenades the crowd with a medley of rock instrumentals during “Engineering’s Got Talent” last spring. Vaibhav Gupta breaks down those stereotypes with a loud riff from his electric guitar. Gupta expressed his love of electric soft rock in the “Engineering’s Got Talent!” contest hosted by Engineering Presidents Council last spring. He performed three songs, the traditional guitar song “Spanish Romance,” “Wake Me Up When September Ends” by Green Day, and the rock classic “Stairway to Heaven” by Led Zeppelin. It was a big moment for him; Gupta usually just plays by himself or for his friends. He won a participation certificate for his act. “I did fine and I got lots of appreciation from the audience,” says Gupta. He’s been playing since his undergraduate days and primarily plays in the soft rock genre. Gupta enjoys the quiet of the West Lafayette area, “I enjoy the academic and international feeling of the city.” When he’s not working at his studies he can be found at home practicing his guitar skills, hanging out with friends or eating his favorite Indian and Mexican foods. He arrived in the United States in 2008 to attend Purdue as a PhD student in ECE with VLSI and Circuit Design as his major. Gupta got his undergraduate degree in electrical engineering from the Indian Institute of Technology in Kharagpur, India. His current PhD focus is approximate computing and low power VLSI system design and optimization for communication and signal processing systems. Gupta has made his mark in ECE; he has been a T.A. for four semesters in Linear Circuit Analysis I and II and participated in a project design contest called Innovate North America. His three-man team created I-QCAM, which is an energy-efficient camera on a chip. It’s based on the concept of significance-driven computation. It can save power and prolong the life of a battery according to the image quality desired by the user. Gupta’s team placed third in the contest. Because of his enjoyment of academia and research, Gupta hopes to remain in a similar setting after finishing his PhD. He’s already giving out study tips. “Set daily goals and routines and stick to them.” What inspires Gupta about engineering is the chance to use the concepts he’s learned to solve real-world problems.